When I said to you all yesterday that I thought the WAMC Rollercoaster run was going to be my kind of event I was right, I had an absolute great time and it was exactly what the name said it was “a roller coaster ride”up hills and down hills. To me it seemed like a really good training session for the upcoming city to surf witch is up and down kings park and I’m told it’s one of, if not the hardest on road marathon of the season. I thought it was going to be a little harder to run up than it actually was,perhaps running up the sand hill and tracks at the Wally cairns cross country last week really made a big difference cause I didn’t have any problems at all and when I climbed to the top I quickly propelled down again and then I slingshot a good percentage of the way up again, the advantages of being in a Wheelchair I suppose. It was like really being on a roller coaster that was ten kms long. I was loving every bit of it and at times I thought that It looked like other people wished that they could have been on the same ride I was on, because I rolled all the way on the down parts,that means I only had to push on the up hills parts meaning I only had to run half as much as every one else, another perk of the chair. The path was also very flooded in sections due to all the rain and very high tides, everyone got wet feet as there was no way to avoid it except me I rolled strait threw it and had no issues besides having to wash the salt off my chair when I got home to avoid the bearings from rusting. I only replaced them on Friday, the front casters as well. 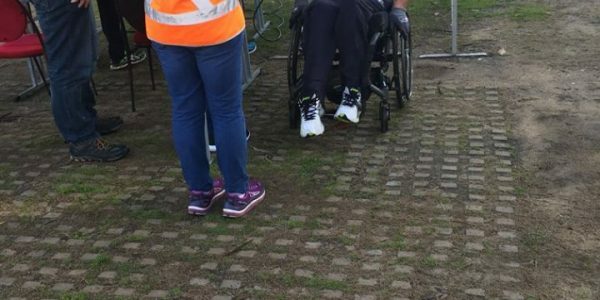 It was the first time I’d done it since i’v owned the chair had I not it would have been dangerous coasting down ether to myself or others, it was a little bit hairy coming down the narrows bridge at the Perth marathon and I was worried about them. With the hills today being so much bigger it was good to not stress about them catastrophically failing at up to fifty Kms an hour instead I just relaxed and was able to have lots of fun with it, all in all I had a great time managed to run a time I thought was fair fifty five mins and I look forward to it next year if I don’t run the armadale half marathon thanks to all the people who encouraged me to keep the pace and making it fun. I’m now hoping to run four hours and ten mins at the city to surf I hope it fairly realistic.